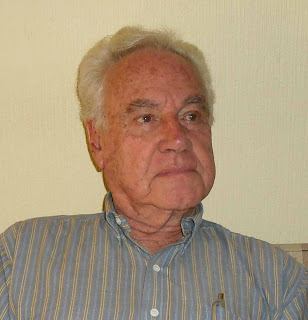 Celso Garrido-Lecca Seminario was born in Piura, Peru, on March 9, 1926. He studied in the Academy of Music Sas-Rosay of Lima between 1944 and 1946, and later with the German composer Rodolfo (Rudolph) Holzmann at the Lima National Conservatory of Music between 1947 and 1950. In 1949 he entered the Agrupación Espacio, comprised of young architects, artists, and intellectuals. In this group, he organized, with Enrique Iturriaga, the first prominent concerts of contemporary music in Peru. 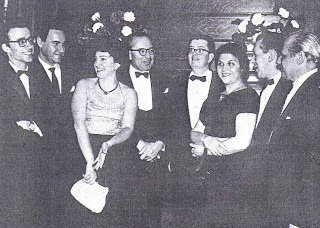 In order to advance his compositional studies at the National Conservatory of Chile, in 1950 Garrido-Lecca traveled to Santiago de Chile thanks to a scholarship offered by Domingo Santa Cruz; he primarily worked with Santa Cruz, who helped him improve his knowledge of counterpoint. Between 1952 and 1954 Garrido-Lecca studied with the Dutch composer Frederick Focke, a disciple of Anton Webern, who introduced him to serialism. During this period Garrido-Lecca began his first acknowledged composition, Orden for piano, composed in 1953. This work was premiered by the Chilean pianist Mariana Grisar, Garrido-Lecca’s first wife, who performed this piece in multiple concerts and radio programs presented by the Grupo Tonus in 1953. While Garrido-Lecca was a student in Santiago, he got a job as a sound engineer at the Experimental Theater of the University of Chile, where he remained for ten years (1954-64). In this group he began to experiment with the composition of incidental music, writing numerous scores for classical plays by Sophocles, Shakespeare, Calderón, Anouilh, Buzzati, among others. All these works were written in an eminently tonal language, in clear opposition to Orden, Divertimento para quinteto de vientos, and other twelve-tone compositions of the same period. As part of the Experimental Theater, Garrido-Lecca met the well-known actor, singer, and songwriter Víctor Jara, who later became one of the main figures of the musical movement Nueva Canción Chilena and a martyr of the military junta that executed a coup d’état in Chile on September 11, 1973. Between September and October 1963, Aaron Copland toured South-America, with stops in Brazil, Argentina, Chile, and Colombia. He visited Chile between October 3 and 11, participating in multiple activities with various local musicians, particularly with Domingo Santa Cruz, Celso Garrido-Lecca, León Schidlowsky, Pablo Garrido, and Juan Pablo Izquierdo. Copland received an honorary professorship from the University of Chile and participated in meetings with the members of the National Association of Composers (ANC) and students of the Faculty of Arts. The friendly relationship between Copland and Garrido-Lecca in the 1960s can be confirmed from the notes that Copland left in the hand-written journal he used during the trip. In the same year Garrido-Lecca received a second fellowship, this from the Guggenheim Foundation, in order to improve his knowledge of orchestration. As did many other Latin American composers of the period, he attended the summer courses of Tanglewood, where he studied with Copland during the following year. Curiously, he obtained this fellowship not as a Peruvian composer but as a Chilean. In 1964 Garrido-Lecca participated in the First Music Festival of America and Spain, which took place in Madrid. On that opportunity, his Symphony No. 1 was performed by the Symphony Orchestra of that city, conducted by Vicente Spiteri. During the same year his String Quartet No. 1 was presented in the IX Biannual Festival of Chilean Music, a composition of “disconcerting objectives,” in the opinion of Enrique Rivera. In May 1965 Garrido-Lecca participated in the Third Inter-American Music Festival in Washington, D.C., with his orchestral piece Laudes. The premiere of this work, however, was damaged by an unfortunate incident: Lukas Foss, conductor of the Buffalo Philharmonic Orchestra, interrupted Laudes in the middle of its performance because of the noise produced by the air conditioning system. Domingo Santa Cruz soundly criticized what he considered the childish attitude demonstrated by Foss during the performance of Garrido-Lecca’s work and also lamented that the composition was not performed from the beginning after the air conditioning was turned off. In 1965 Garrido-Lecca began his pedagogical career as a professor of composition of the Faculty of Arts at the University of Chile, where he remained until 1973. During this time, he was involved in multiple activities as president and member of the National Association of Chilean Composers (ANC). Among other things, in 1966 he participated in the X Biannual Festival of Chilean Music with his orchestral work Laudes; at the next occurrence of the same festival two years later, his Intihuatana for string quartet was performed. In 1971 Garrido-Lecca composed the songs “Brigada Ramona Parra” and “Vamos por ancho camino,” based on lyrics by Víctor Jara, for his album “El derecho de vivir en paz” (The Right to Live in Peace) produced by DICAP records. One year later, Garrido-Lecca attended an Encounter with Latin American Music organized by Casa de las Américas in Havana, Cuba, where he clearly demonstrated his integrated vision for music involving folk, popular, and classical traditions. In 1973 he worked with Víctor Jara, the dancer Patricio Bunster, the musical group Inti-Illimani, and many other artists in the production of an unperformed ballet “Los Siete Estados” (The Seven Stages). In September 1973 Garrido-Lecca’s residency in Chile was unexpectedly jeopardized when the universities and other cultural institutions were closed or reorganized by the new military government. His life was also at risk because of his leftist political ideas, his close relationship with the recently assassinated Víctor Jara, and his active participation in the Nueva Canción Chilena movement. Shortly after the military coup d’état, the musicologist Samuel Claro Valdés became the head of the Faculty of Arts at the University of Chile. Although Claro supported Garrido-Lecca’s continued tenure as a professor of composition on the faculty, many colleagues recommended that he leave the country. After spending two months in hiding to avoid the possibility of arrest, Garrido-Lecca finally decided to return to Peru, arriving there on November 4, 1973. Shortly after his return to his home country, Garrido-Lecca established a series of important courses in instrumentation and composition, developing an intense, new musical activity in Lima. In 1974 he assumed the professorship of composition and orchestration at the Lima National Conservatory of Music, serving as its director between 1976 and 1979. He reinvigorated this institution and established close ties between the conservatory and the community. In Peru he married Alicia Saco and had two children: Gonzalo Garrido-Lecca Saco, a composer who currently lives in Spain, and Ximena Garrido-Lecca Saco, a painter who presently lives in London. 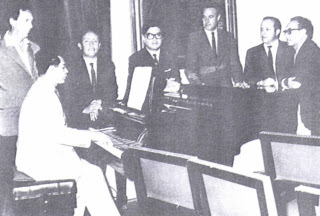 Between 1976 and 1979 Garrido-Lecca created a Popular Song Workshop at the Lima National Conservatory, where numerous and important popular music groups originated, such as Tiempo Nuevo, Vientos del Pueblo, Dúo Adagio, and Korillacta. After 1979 Garrido-Lecca initiated numerous governmental programs related to musicology and the conservation and development of the Peruvian musical heritage. Among other activities, he coordinated regional programs of musicology sponsored by UNESCO (1979-1983) and organized the first national meeting of stringed instrument makers (1980). In 1981 he founded the Center for the Documentation of Peruvian Music at the National Library, and organized a conference of Latin American musicologists in 1982. In 1981 he won a contest organized by the Patronato Popular y Porvenir Pro Música Clásica of Lima with his orchestral work Retablos sinfónicos. He received a similar prize in 1984 for his orchestral work El movimiento y el sueño. In 1982 he was awarded the “Orden del Mérito Civil en el grado de Comendador” (Medal of the Order of the Civil Merit at the rank of Commander) from the Spanish Government, and also obtained an invitation from the Ministry of Exterior Affairs of that country that allowed him to visit Spain. Between 1983 and 1984 he conducted the cultural development program of the National Institute of Culture of Peru. After a period dedicated to reabsorbing the rich popular musical traditions of his home country, Garrido-Lecca once again became active in the Latin-American musical scene as a composer with a definitive personality. 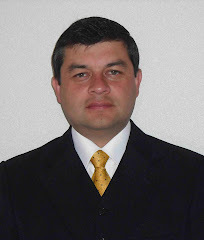 Since 1983, he has traveled frequently to Santiago de Chile, where he has established strong contacts with the new composers and performers. Several of his chamber works, such as Trío para un Nuevo Tiempo, String Quartet No. 2, Simpay, Sonata Fantasía, and Dúo concertante for charango and guitar, have been premiered in Santiago by Chilean performers in various concerts of contemporary music. By the early 1990s, Garrido-Lecca had earned his well-deserved fame as one of Latin America’s most eminent composers becoming one of the most illustrious names in Peruvian culture, along with his equally distinguished compatriots, Mario Vargas Llosa in literature and Fernando de Szyszlo in painting. He attended the First Latin American Music Festival of Mexico in 1990 and, one year later, the Fifth Latin American Music Festival undertaken by the Organization of American States in Caracas. In 1995 Garrido-Lecca won the first prize in a chamber music contest organized by the Chilean Copyright Society (SCD) with his String Quartet No. 3, subtitled “Encounters and Tributes.” In 1996 UNESCO sponsored the edition of a CD containing five chamber works by the Peruvian composer in homage to his seventieth birthday, titled “Músicos latinoamericanos interpretan a Garrido-Lecca” (Latin American musicians perform Garrido-Lecca); this CD was presented in the Sala Blas Galindo of the Arts Center in Mexico City, in January 1997. In 1997 the Revista Musical Chilena published Garrido-Lecca’s article “El arte en la economía neoliberal” (The Arts in the Neoliberal Economy) in the context of a round table in which three composers analyzed the relationship between music and neoliberalism. In June 1997 the Chilean government conferred on Garrido-Lecca the Order “Bernardo O’Higgins” with the status of Official for his recognized work in the strengthening of the bonds of friendship between the countries of Chile and Peru. One year later Garrido-Lecca was nominated as “the most outstanding composer of the year” by the Chilean Copyright Society (SCD). At the end of 1999 he was appointed the director of the music journal Cuadernos, edited by the Lima National Conservatory of Music. In 2000 Garrido-Lecca and an additional twenty members of the guild of Latin-American composers signed a manifesto in Mexico City, which was published in the Revista Musical Chilena. In October 2000, the jury for the third Ibero-American “Tomás Luis de Victoria” prize was convened in Mexico City. The panel was comprised of the musicologist Victoria Eli (Cuba), the pianist Jaime Ingram (Panama), and the composers José Augusto Mannis (Brazil), Fernando García (Chile), Agustín Bertomeu (Spain), Alfredo Rugeles (Venezuela), and Manuel de Elías (Mexico). They analyzed the works of fifty-five composers from fifteen different Ibero-American countries, and selected Celso Garrido-Lecca. The winner of the prize was announced on October 18, 2000, in the Palacio de Bellas Artes of Mexico City. On June 8, 2001, in the Symphonic Hall of the National Auditorium of Music in Madrid, Celso Garrido-Lecca received the “Tomás Luis de Victoria” prize, conferred by the Fundación Autor and the General Society of Authors and Publishers of Spain (SGAE), as the best Ibero-American composer of the year 2000. After the ceremony, several pieces by Garrido-Lecca were performed, including Elegía a Machu Picchu for orchestra, Cello Concerto with the soloist Carlos Prieto, and the world-premiere of his Symphony No. 2, performed by the soprano Irene Badiola, the National Chorus and the National Orchestra of Spain, conducted by Pedro Ignacio Calderón. In 2001, the second issue of the Revista Musical Chilena was dedicated to Garrido-Lecca in honor of this prize. In May 2002 Garrido-Lecca acted as the president of the jury for the fourth “Tomás Luis de Victoria” prize, won by the Venezuelan composer Alfredo del Mónaco. One year later, Garrido-Lecca’s Secuencias for violin and orchestra was selected as the obligatory piece for the best performer of this instrument in the Music Festival “Instrumenta Verano 2003,” which took place in Puebla, Mexico. Several tributes were offered to Celso Garrido-Lecca during 2006 in honor of his eightieth birthday. The XIV Latin American Music Festival of Caracas, celebrated in May 2006, was dedicated to him. On June 22, 2006, he received an honorary professorship from the University of Chile, and three of his works were performed in the Sala Isidora Zegers of the Faculty of Arts. On October 26, 2006, there was a concert in homage to Garrido-Lecca in his home town of Piura, by the Municipal Symphony Orchestra of that city conducted by Abraham Padilla. On November 17 the National Symphony Orchestra of Peru, conducted by Padilla, culminated the Fourth International Festival of Contemporary Music of Lima 2006, performing two orchestral pieces by Garrido-Lecca: the Guitar Concerto and Retablos sinfónicos (Symphonic Tableaux). In 2008 the Fundación Autor and the General Society of Authors and Publishers of Spain (SGAE) released a CD in homage to the composer that included three of his orchestral works: Eventos, the Guitar Concerto, and the Symphony No. 2. The production of Celso Garrido-Lecca encapsulates the important developments in art music in Peru and Chile during the second half of the twentieth century. These trends include musical elements from the Second Viennese School, influences of Alexander Skryabin’s mystical conceptions, use of native instruments and performance styles from the Andes, references to mestizo and Creole musical manifestations in Peru and Chile, and quotations of popular songs by the Chilean singer-songwriters Violeta Parra and Víctor Jara. Several compositions of Garrido-Lecca have been commissioned by important institutions, conductors, or musical ensembles, including the Library of Congress in Washington, D.C., the Edwin Fleisher Music Collection of Philadelphia, the German conductor Hermann Scherchen, the Mexican cellist Carlos Prieto, among many others. Most of his production has been published, performed, and recorded in Peru, Chile, Spain, Mexico, and the United States. Garrido-Lecca himself has divided his musical output into three major periods. His years of residence in Chile (1950-73) constitute a first compositional period, in which he explored the techniques and aesthetics of European avant-garde music. During this phase he also composed incidental music for the theater and collaborated with singers and performers of the Nueva Canción Chilena movement, particularly with Víctor Jara and the musical group Inti-Illimani. Important works of this period are: Orden (1953), Symphony No. 1 (1960), Laudes (1963), Elegía a Machu Picchu (1965), and Antaras (1968). After 1973, indigenous and popular styles are more evident in his works, due to his reconnection with the culture and musical traditions of Peru. In this process of personal rediscovery of his roots, a fundamental change occurs in his music: the pieces composed between 1973 and 1984 reveal a search for simplicity, a preference for tonality and the presence of rhythms, melodic gestures and formal characteristics associated with folk dances and songs. Until the early 1980s, Garrido-Lecca also composed many songs for the soloists and musical groups he formed in the Popular Song Workshop at the Lima National Conservatory. Important works of this period are: Cantata Popular Kuntur Wachana (1977), Danzas populares andinas (1979), Pequeña suite peruana (1979), and Retablos sinfónicos (1980). After 1985, the oeuvre of Garrido-Lecca took its most recent path. This is a period of synthesis during which serialism, the native and mestizo musical elements from Peru and his personal experience with the Nueva Canción Chilena movement are mixed in a unique combination. Important works of this period are: Trío para un Nuevo Tiempo (1985), String Quartet No. 2 (1987), Cello Concerto (1989), Guitar Concerto (1990), Dúo concertante for charango and guitar (1991), and Symphony No. 2 (2000).